Saudi Arabia is set to privatize airports and the country’s Public Investment Fund has been chosen to look after the aerial outlets, reports say. “The process of establishing companies will continue for all airports, and the civil aviation holding company in the future will be 100 percent owned by the Public Investment Fund,” Mohammed al-Shetwey, aid of the President of the General Authority of Civil Aviation (GACA) for financial affairs, Mohammed Al-Shetwey said. Each airport will be assigned a company, Shetwey was quoted by Saudi Press Agency as saying. The Saudi official was not specific how the Public Investment Fund would sell stakes in the airport companies under the privatisation program. According to Reuters, last month Saudi Arabia hired Goldman Sachs to manage the sale of a stake in Riyadh’s King Khalid International Airport. 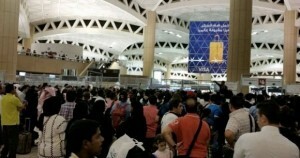 The airport will undergo refurbishment after the Hajj pilgrimage. King Khalid airport received 22.5 million passengers last year.